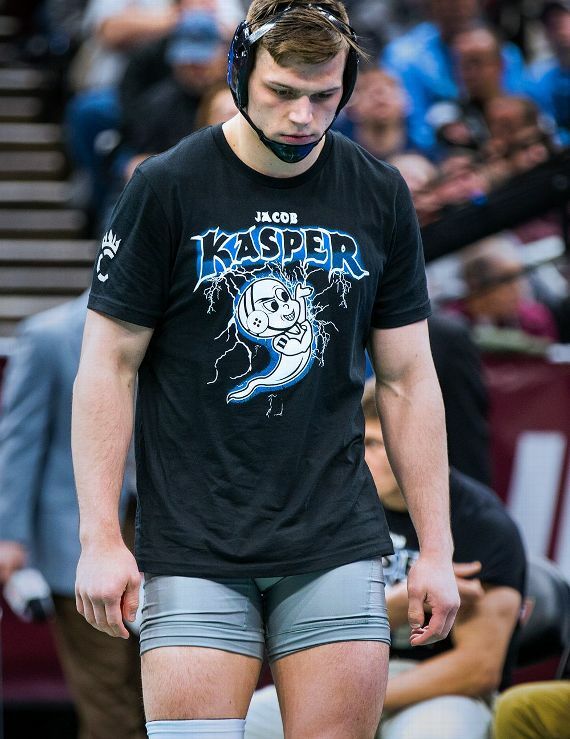 kenneth in the (212) jump: Is Jacob Kasper the New John Cena? Is Jacob Kasper the New John Cena? Always be strong, you never know who you are inspiring. Each of those avenues has produced its own fair share of talent, but the ranks of amateur wrestling have long been the most fruitful source of pro wrestling talent. The list of Hall of Fame-level amateur wrestlers who became pro stars is vast and speaks for itself; Brock Lesnar, Kurt Angle, Jack Brisco, Bob Backlund, Gorilla Monsoon, The Iron Sheik, Verne Gagne and Danny Hodge are just a few of the names that immediately come to mind. Even though it has expanded the scope of its talent searches in recent years, the WWE certainly hasn't forgotten amateur wrestling. 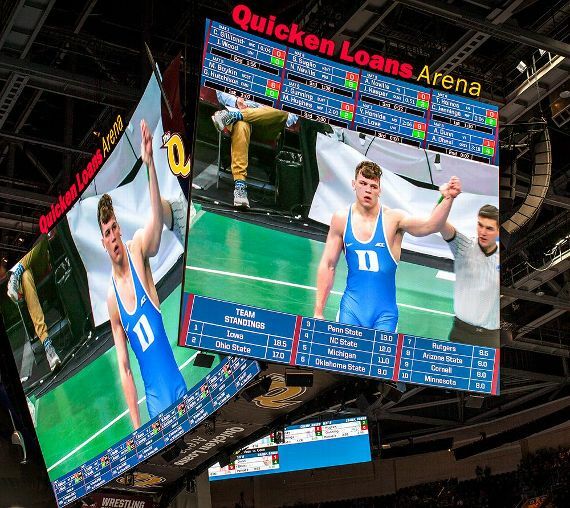 There are a few wrestlers the WWE has eyes on every year, and a few surprises that pop up, but it always has a presence at the annual NCAA wrestling championships -- and this year in Cleveland was no different. The promotion's current resident amateur wrestling expert and point man at the tournament was WWE Hall of Famer and former AAU wrestling champion Gerald Brisco, who had an eye out for any potential future WWE superstars in the field. The prospects Brisco has found over the past nine years, including Lesnar, have shined in part because Brisco sets the recruiting bar very high. "I don't recruit a prospect unless I think the person has the potential to main event WrestleMania," Brisco said. Though there's a lot more variety in the type of wrestler who can be a star in the WWE in this era, Brisco tends to focus on those who are physically large enough to fit into the classic mold of what a wrestler should look like. That means focusing on the heavyweights and a few of the other higher weight classes, looking for bigger athletes or those with a frame that could ostensibly reach the 225-pound range. 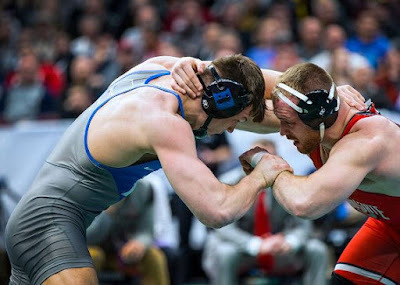 The 2018 NCAA wrestling tournament featured a number of candidates who fit Brisco's qualifications, with his No. 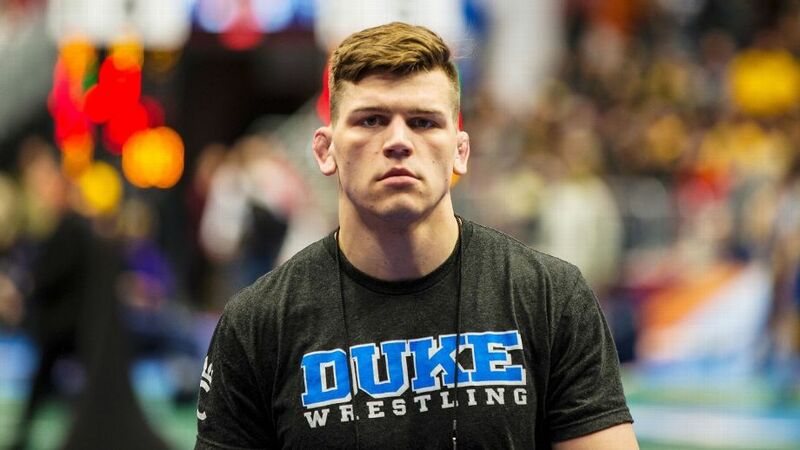 1 prospect to headline a future WrestleMania being Duke's two-time All-America heavyweight, Jacob Kasper. Kasper is a slam dunk in terms of size, as a legitimate 6-foot-3, 230-pound heavyweight who still has room to add more muscle when the time comes. More than that, Kasper has the personality, athletic ability, willingness to wield a microphone and a number of other factors that make him a special prospect coming out of college. "In my nearly 50 years in the wrestling business, I have seen only a few wrestlers who have such powerful personalities that when they come into a room, everyone there knows that person has arrived," Brisco said. "Jacob Kasper has that type of personality, and he reminds me in many ways of a young John Cena." That's high praise from a man who has spent the majority of his life involved in the worlds of pro and amateur wrestling. Brisco's road to serving as a WWE talent scout started with his days wrestling at Oklahoma State, carried through his days traveling the territories with his older brother Jack in the heyday of the NWA and also included a lengthy stretch in the WWE's front office. Brisco also spent time performing as an on-screen character during the WWE's Attitude Era, but his career came to a crossroads after he suffered three strokes in 2009 that left him unable to keep up with the grueling travel demands. After Brisco recovered, he told WWE Chairman and CEO Vince McMahon that he was going to have to retire from the business because of his health issues. Brisco said that McMahon replied by saying, "You have been with me from the beginning and I still need you with the company" and asked Brisco to find a role that could allow him to continue working for the WWE. Brisco figured out exactly what he wanted to do. His lifelong passion for the sport of amateur wrestling had already helped Brisco recruit some of the nation's top amateur wrestlers to sign WWE contracts. Exclusively dedicating himself to this endeavor offered him the perfect way to find new talent for the WWE while also keeping to a more limited travel schedule. McMahon signed off wholeheartedly, and Brisco quickly transitioned into scouting amateur talents on a full-time basis. Kasper's origin story began with dreams of pro wrestling stardom, which started when he and his two brothers used to hold faux wrestling cards in their basement. That eventually evolved into doing moves that incorporated jumping from the roof of the family shed onto a trampoline set up next to the shed. These childhood battles fueled Kasper's passion for entertaining to such an extent that his parents ended up getting him every toy WWE belt under the sun. Even as he began to excel as an amateur wrestler, Kasper held on to his dream of one day stepping into the squared circle and becoming one of the biggest stars in the WWE. "I always thought it would be awesome to perform at a WrestleMania in front of 90,000 fans and leave an impression on them that would last for the rest of their lives," Kasper said. These lofty dreams could have remained idle visions, had it not been for Kasper's intense drive to succeed and his knack for drawing attention to himself -- a trait Kasper tapped into to get Brisco's recruiting eye pointed squarely in his direction in 2016. Brisco had sent out a Twitter post about some prospects he was looking at, and Kasper saw his chance, so he sent out a reply tweet that said he and his teammate "are where its at" and "Way better looking, charismatic, faster, and athletic" than the wrestlers Brisco was scouting. When Brisco saw Kasper's post, which showed good "heel" instincts, Brisco knew that Kasper was someone to keep an eye on in his search for the next WWE superstar. Brisco's college wrestling ties meant that he was on very good terms with Duke head coach Glen Lanham, a former All-American wrestler and assistant wrestling coach at Brisco's alma mater, Oklahoma State. 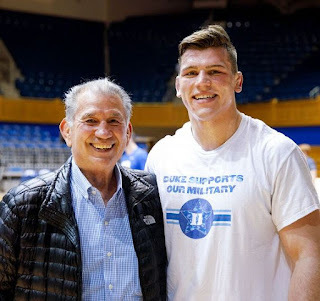 Lanham made it clear that Kasper was the "real deal," and from there Brisco made sure to keep tabs on the Duke standout whenever possible. There were a lot of different skills and indicators that Brisco was looking out for. Microphone skills, for example, are typically the largest stumbling block for any amateur wrestler pursuing a chance at WWE stardom. They can be especially hard to gauge because, as Jacob's father, Brad Kasper, put it, "Amateur wrestlers are like gladiators. They don't talk a lot and no one wants to be the bad guy." Gladiator or not, Kasper wasn't afraid of being perceived as the bad guy in the lead-up to his 2017 NCAA wrestling championships semifinal match against the legendary Kyle Snyder, the youngest American Olympic wrestling gold medalist in history. Kasper called out Snyder by saying he wanted to "punch him in the mouth" -- in a competitive sense -- and that alone made Kasper take on the heel role in the amateur wrestling community. The comment made an even bigger impact in his home state; Kasper was born and raised in Ohio, didn't go to Ohio State and he was calling out Snyder, one of the best athletes in Buckeyes history. 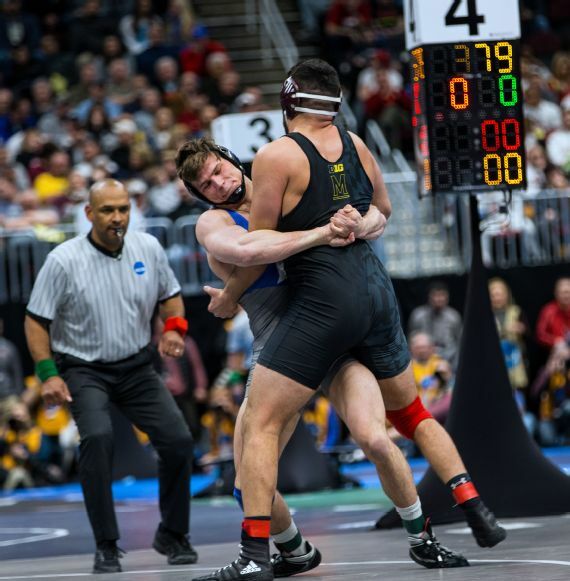 It didn't end well in Kasper's first match with Snyder, a semifinal loss that ended in a 19-6 major decision, but that defeat did little to slow down Kasper's personality. Kasper maintained his penchant for speaking his mind when he took to Twitter to call out Jon Jones in the weeks leading up to his 2017 UFC fight against Daniel Cormier. Kasper shared his strong opinions about Jones in a Twitter post that said, "You can think Jones is going to win [in the fight against Cormier], that's fine. But if you're rooting for him to win you really need to evaluate your morals & who you are." Kasper caught Cormier's eye, and ultimately helped Cormier train in wrestling in the lead-up to the fight. Duke assistant wrestling coach Ben Wissel said there is much more to Kasper's speaking skills than just making big statements. "You listen to normal sports interviews and the players give clichéd answers," Wissel noted. "When Jacob gives an interview, you have no real indication where he will take a question or how long he will talk about it. Even I have no idea where he's headed and I've known him for years. He is a reporter's dream and makes every other wrestler look bad in that area by comparison." The ability to talk circles around other people can have maximum impact when combined with a signature look -- and Kasper has displayed equal mastery on that front. He seems to live by Ric Flair's adage that there is no price too high to pay for image enhancement, whether it comes to his dizzying collection of wrestling shoes or the custom T-shirts he's had printed for a number of his major events. All of these promotional elements made a huge impact on Brisco as well, as he said that he has never had anyone recruit himself into a tryout opportunity the way Kasper has. Brisco feels strongly that Kasper understands the business and knows how to promote himself. Those skills would be for naught if he couldn't back them up with physical gifts, but Kasper's record on the mat speaks for itself. "Anyone who earns a spot in the NCAA wrestling tournament has more than enough athletic skill to make it in the WWE," Brisco said. 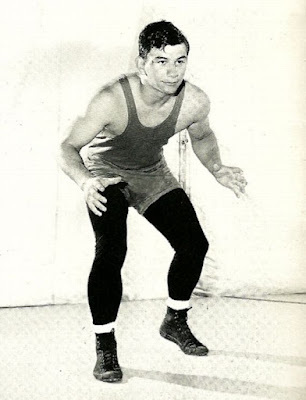 He also noted that the more title wins a wrestler garners at the collegiate level, the greater his potential drawing power could be once he reaches a position where his accolades can be used as part of his marketing and promotion. Kasper has an ample number of victories to his credit. In addition to being a two-time All-American, he won the 2018 ACC heavyweight title, set a Duke record for most wins in a single season (37) and ranks second in Blue Devils history in career wins (106). Kasper also placed fifth in the 2016 Olympic wrestling trials and may not be done with his amateur wrestling career despite his collegiate career coming to an end, with thoughts of trying out for the Olympics in 2020. His drive toward the future also has him thinking of outside-the-box ways he can improve his stock as a WWE recruit. He can already do a standing front flip and back flip, and Kasper is working with a gymnastics trainer to further expand his abilities. On top of all that, Kasper's mental acumen doesn't take a backseat to his physical talents either, with the former premed student touting three-time NCAA Academic All-American honors. Despite all of the elements working in his favor, Kasper didn't have the easiest road to success because of a major personal hurdle with his health. Kasper has waged a years-long battle with Crohn's disease, an intestinal ailment that can lead to a variety of serious physical issues, and one of those Crohn's flare-ups occurred prior to the 2018 NCAA championships. It caused Kasper's weight to fall to 212 pounds, making him the lightest heavyweight in the tournament. Despite the pain and loss of energy, Kasper showed grit in reaching the semifinals, where he gave Snyder a much tougher match than their first time out before ultimately losing 10-5. Though his fourth-place finish is an impressive achievement by any measure, Kasper, true to form, wasn't satisfied. "I came here to win the tournament and didn't do so, and it's a disappointment that I'll have to live with for the rest of my life," Kasper stated bluntly. Brisco saw the tournament in an entirely different light, saying, "Jacob making it to the semifinals despite his Crohn's flare-up shows just how much character he has." If there was any doubt in Brisco's mind as to whether or not Kasper had what it took, this performance sealed the deal. A few weeks after the NCAA tournament ended, Brisco contacted Kasper and gave him an official invite to the NXT tryout camp being held at the WWE's Performance Center in Winter Park, Florida, in late June. The tryout is essentially a three-day job interview that includes a number of workouts to test the prospects' cardio endurance and classes to teach them pro wrestling basics such as running the ropes and hitting the turnbuckles properly. Kasper should have no trouble showing off his physical abilities in those moments, but Brisco points to the shortest part of the tryout as one of the most valuable and important in the eyes of those conducting the trials. Each of the prospects has to give a one-minute promo that should tell company why he or she wants to work in the business. "We don't want the wrestlers to cut a 1970s-style promo where they talk about tearing somebody's arm off," Brisco said. "We want them to tell us why the WWE should invest the time, effort and money into hiring and promoting them." If Kasper does as well as Brisco believes he will at the tryout, he can count on continued support from the Tampa-based Brisco, who said, "If Jacob signs with the WWE, I will spend more time helping develop him than I have with any other prospect I have ever signed." For Brisco, someone who already struck gold with a generational star once with Brock Lesnar, Kasper is just the kind of talent that the WWE wants to build around moving forward. "Vince McMahon wants to change the image of wrestling," Brisco said. "Jacob Kasper can help change that image."